Be the first to share your favorite memory, photo or story of Eleroy. This memorial page is dedicated for family, friends and future generations to celebrate the life of their loved one. Eleroy Claire "Sam" Ayers was born July 25, 1929 to William Henry and Ester Victoria (Wistrom) Ayers in rural Oakland, Nebraska. 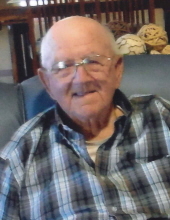 He passed away Thursday, February 28, 2019 at the Oakland Heights Assisted Living in Oakland. Eleroy lived around the Oakland area all his life. He attended rural schools in the area before graduating from Oakland High School in 1947. After graduation, he went to work for Burlington Railroad and also helped his dad on the farm. In 1951, he joined the United States Marines and served through 1953. After the service, he went back to work for Burlington Railroad for 40 years. Eleroy was known as “Sam”, a name given to him by fellow workers on the railroad. In 1967, Eleroy married Louise Lunden. Eleroy loved gardening and enjoyed traveling in his retirement. Eleroy moved to the Oakland Heights Assisted Living 5 ½ years ago and enjoyed the staff, residents and all the activities that were provided. He is preceded in death by his wife, Louise; parents; brother, Loran. Eleroy is survived by his daughters: Diane (Jim) Falk of West Point, NE, Linda Lunden of Grand Island, NE; 4 grandchildren: Sarah (Brad) Scoles of Oakland, Tim Piper of West Point, Levi Laeffelholz of Grand Island, and Rolanda Kucera of Blue Springs, NE; six great grandchildren; and 1 great-great grandchild. Military Honors will be held at the Church. "Email Address" would like to share the life celebration of Eleroy "Sam" Ayers. Click on the "link" to go to share a favorite memory or leave a condolence message for the family.